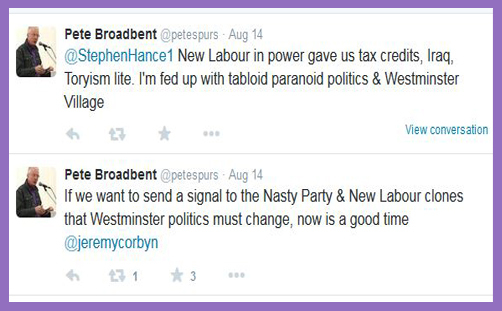 Pete Broadbent, Bishop of Willesden, has joined the Rev’d Giles Fraser and finally come out for Jeremy Corbyn. This is that same Jeremy Corbyn of whom Tony Blair says is transporting us to a fantasy programme of “Alice in Wonderland” politics. But that’s of no concern to Bishop Pete, for whom Mad-Hatter (or Cheshire Cat?) Blair pursued and still advocates a political programme more redolent (or prescient) of ‘Alice: Madness Returns‘, in which “Tory-lite” trauma and DWP death squads are conjoined and inseparable from the evil forces of New Labour. “We offered nothing to anyone at the last election. In England or Scotland. Wearing Tory lite clothes is no longer credible,” says Bishop Pete. Note the “We”. Can you imagine a bishop ever using “We” of Margaret Thatcher or the Conservative Party? It is a curious elision from the weighty matters of political complacency and the corruption of capitalism to the utterly trivial matter of how MPs address one another. Is it “rubbish” to address the Archbishop of Canterbury as ‘Your Grace’, or the Queen (setting aside for a moment his visceral antipathy) as ‘Your Majesty’? The Chancellor’s middle name is actually George: his first name Gideon. But Pete Boorish Broadbent knows that. It isn’t the first time, of course. Presumably, the Chancellor wouldn’t be welcome to worship in Willesden (or Edmonton or Spring Harvest). At least he isn’t made to feel so. In fact, no-one at all on the political right is made to feel welcome by Bishop Pete. We are obviously the most infected of the new lepers. Archbishop Pete in Canterbury and Archbishop Giles in York? God forbid. (Actually, equality sensitivities will henceforth forbid: Harriet Harman would never entertain both Cantuar and Ebor simultaneously being held by white, heterosexual men). But Black Dog appears not to be aware that it is no longer the purview of the Prime Minister to nominate bishops: Gordon Brown devolved that responsibility to the Crown Nominations Commission (which, pace Archbishop Justin, isn’t doing a very good job of filling episcopal vacancies). It is now the task of the CNC to submit the name of a preferred candidate (and a second appointable candidate) to the Prime Minster who is constitutionally responsible for tendering that advice directly to the Queen. This is no longer the Prime Minister’s advice, but that of the CNC: the Prime Minister’s role has been reduced to that of a postbox. That aside, it is good, right and proper that, just as politicians “do God”, so bishops should “do politics”. But there are ways of doing so which sustain missiological latitude; and ways which alienate and insult half the country (not to mention Her Majesty’s democratically-elected Government). ..he is a devout traditionalist, believing that the old paths were righteous and the new progressive piety is a modernist betrayal of Labour’s heritage and a corruption of its liberation theology. “A lot of people are supporting us, particularly young people who want to see a Labour Party that is very different to the Labour Party they have had in the past,” he said. Doubtless a lot of Church of England clergy are praying for him, too: so much left-wing political philosophy derives from lefty-wing applied theology, and there is virtue in philosophical purity even if it means you never get into power. In an age of interminable seeming spin and pious third-way platitudes, his core moral authenticity and political conviction are attractive: he says what he means and means what he says. People are hurting, and he promises lots of kisses and compassion wrapped up in cotton wool and bandages. Any flaws in his economic policy or his lack of small-business appeal is immaterial (literally) against the emotional yearning of the Christian Socialist Movement for the restoration of a theology of community; of fraternity, solidarity and co-operation. The Bishop of Willesden is Old Labour: authentic, moral and un-spun. His anger is righteous; his irritation not unwarranted. In the genuine pursuit of social equality and welfare, he wants a pugnacious Labour leader who will ensure public ownership, full employment, fair wages and the redistribution of wealth for the alleviation of want and hardship. He wants to fight back against the system: “We” are sick of shallow spin and third-way compromise with its dog-eat-dog materialism, elite cronyism, banking bailouts and corrupt capitalism. But bishops like Pete don’t read this, and when they do, they call it a “Tory lie”. When Tony Blair warns of “falling rocks, mudslides, dangerous hairpin bends and then a sheer drop”, he speaks from the experience of having fought three elections and winning them. From a psephological perspective, he was Labour’s most successful leader. If, as he says, Jeremy Corbyn’s revolutionary political programme belongs in an “Alice in Wonderland world”, then Bishop Pete’s left-wing conviction is one which will lead to electoral oblivion. Clerics for Corbyn and Bishops in Wonderland might inspire the socialist converted, but it won’t convert the lost. And without the missiological strategy to reach those who are being lost, there will be no power for social transformation, and so no national salvation.